October 20; PILDAT has welcomed the initiative by the Senate of Pakistan in preparing and publishing the first of its kind Senate Committees’ Journal offering a comprehensive overview of the business activities of the Senate of Pakistan. 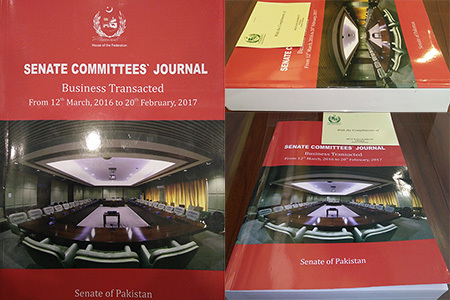 In a felicitation letter addressed to Honourable Senator Raza Rabbani, Chairman Senate of Pakistan, PILDAT thanked the chairman for sharing a copy of the Journal and commended the entire Senate team under the able guidance and leadership of the Chairman Senate for conceiving and delivering this outstanding project. ” You have, indeed, set a new standard in ensuring legislative transparency in Pakistan ,” wrote PILDAT President in the letter addressed to Honourable Chairman Senate. The Senate Committees’ Journal presents a thorough account of very useful data with graphic presentation of distinctive charts illustrating the performance of each Senate committee during the year. The journal sets an exemplary an extraordinary effort of self-accountability on the part of the Committees. PILDAT applauded the leadership of the Senate of Pakistan for having the discipline and energy that is integral to framing and finishing this project that will serve as an example for not just the other legislatures and State institutions of Pakistan but even beyond. PILDAT hoped that the Senate of Pakistan will continue to grow and bring forth such positive changes and initiatives of legislative openness and transparency. PILDAT also offered congratulations to the Secretary Senate of Pakistan, Mr. Amjad Pervez Malik, and Joint Secretary Committees, Mr. Asim Khan Goraya, and the entire team of Senate of Pakistan on this extraordinary accomplishment.